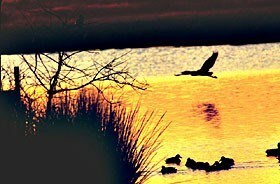 Come to Southern Maryland and immerse yourself in the charm of the Chesapeake. Head out on the bay for a great day of fishing or play on sandy beaches and beat the heat with a dip in the cool Chesapeake waters. While away the day at a dockside café. Dig for fossils and explore Maryland’s ancient cultures and ecosystems at the Calvert Marine Museum or Jefferson Paterson Park and Museum. Experience Maryland’s colonial days at Historic St. Mary’s City, and retrace important sites of the Civil War and the War of 1812. It’s all waiting for you in beautiful Southern Maryland. Enjoy scenic drives, the bounty of local watermen and farmers and the hospitality of Southern Maryland in this quintessential tidewater wonderland. Route of John Wilkes Booth A significant stop along the trail of fugitive assassin John Wilkes Booth, the Dr. Samuel Mudd House & Museum in Waldorf is dedicated to the time and events surrounding President Abraham Lincoln’s assassination. Surratt House Museum in Clinton was once the home of Booth’s notorious accomplice, Mary Surratt. 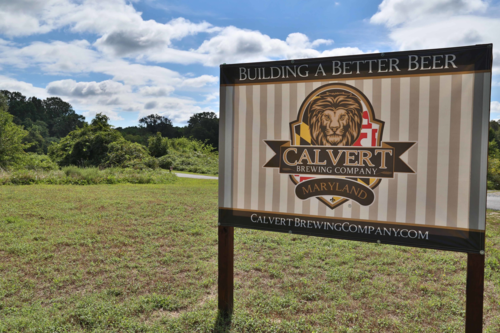 The Calvert Marine Museum in Solomons explains and interprets the physical history of Southern Maryland and the Chesapeake Bay with a handson, interactive experience and popular river otter exhibit. The museum’s annual Sharkfest takes place on the second Saturday in July, and riverboat cruises depart daily from the museum’s own dock. As a member of the independent Atlantic League of Professional Baseball, the Southern Maryland Blue Crabs play 70 home games from late April to September at Regency Furniture Stadium in Waldorf. Dozens of Major League alumni once honed their skills here with the Atlantic League. 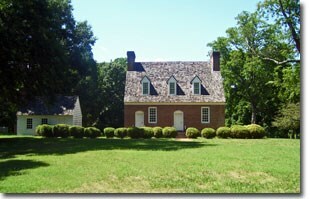 A Tidewater plantation, historic Sotterley Plantation dates back to 1699 and is a testament to the region’s Colonial history. The former tobacco plantation is now a 95-acre National Historic Landmark dedicated to research, preservation and an interpretation of early American plantation life. 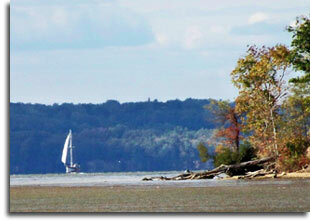 Come spend a day where the Potomac meets the Bay. Home to one of the Union’s most infamous prisoner-of-war camps, Point Lookout has been called the most haunted place in America. The park is also home to the beautiful Point Lookout Lighthouse and great fishing! 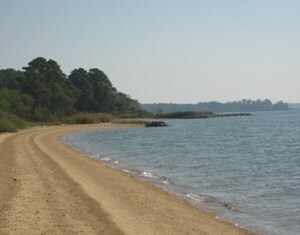 Secluded shores and stunning sunsets over the Patuxent River call from Jefferson Patterson Park & Museum. Public archeological digs at this 17th-century tobacco farm as well as a Native American village museum with reconstructed dwellings blend a mix of history that stretches from the indigenous people all the way to colonial, early American and 20th-century life. Thrill at the sights and sounds of the world’s fastest sport at the Maryland International Raceway. You’ll want to bring your earplugs for the various motor sports drag racing events held on the tracks of Mechanicsville from March to November. 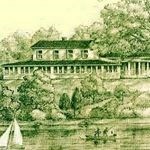 Stop in at the St. Clement’s Island Museum (located on the mainland) and learn about the history of the early colonists through to the watermen of today, then board the ferry to explore the 40-acre island where Maryland’s first European settlers landed. The Blessing of the Fleet in October is a great time to visit. Learn ongoing naval aviation history and how the U.S. Navy established its flight test center at Patuxent River Naval Air Station Museum in Lexington Park. Artifacts, photographs, film and memorabilia tell the story. View two dozen naval aircraft on display and test an F-14 Tomcat flight simulator. Combining art and nature, the Smithsonian affiliate Annmarie Sculpture Garden & Arts Center features 30 acres of forests, fields and meadows and paved walking and bike paths adorned with a vast collection of outdoor sculpture as well as gallery Look Out exhibits. Take a Southern Maryland lighthouse crawl from Cove Point and Drum Point to Piney Point and Point Lookout, which is reputedly haunted. 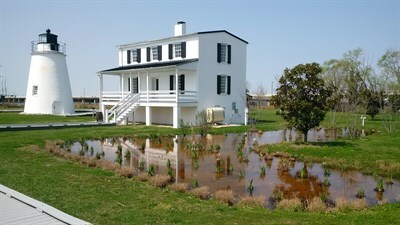 Cove Point offers overnight accommodations, and the iconic lighthouse at Drum Point is located on the site of the Calvert Marine Museum and remains one of three surviving screw-pile lighthouses on the Chesapeake Bay. The Guest Quarters at the Westlawn Inn is a five-unit 1930s boutique-style hotel. This family-owned and operated hotel features two self-contained, condo-style apartments available for short or long-term stays as well as a whole list of amenities, from casually upscale dining to live entertainment. 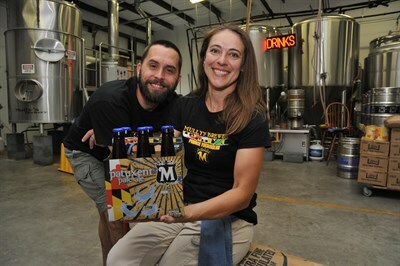 Leonardtown, Southern Maryland’s premier Arts & Entertainment District, is home to the St. Mary’s Arts Council, dozens of galleries and studios, distinct artsy and craftsy retail shopping and dining. By the banks of the Potomac River, Newtowne Neck State Park presents a paddleboarder’s paradise on Breton Bay and ample opportunities for hiking, biking, bird-watching and hunting. Leonardtown’s Wharf Park provides the perfect vista for taking in the region’s signature sunsets on the Bay. Where the mouth of the Patuxent River meets the Chesapeake Bay, Solomons Island has evolved from early 17th century settlements into one of the state’s top tourism destinations—the town’s maritime history has been woven into the fabric of its allure. Climb the lighthouse tower at the Calvert Marine Museum, take a cruise on the harbor or charter a fishing boat. 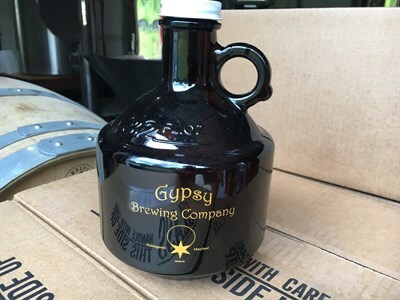 The craft beer craze has also found its way to the Island at the Ruddy Duck microbrewery located in the neighboring Dowell Township. 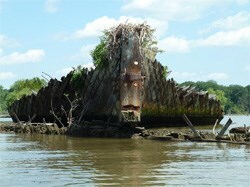 Search our comprehensive list of attractions in Southern Maryland here.